While our daily Blog tends to be an incoherent stream of consciousness, our post-festival review is a place for calm reflection on the festival experience as a whole. When the alcoholic clouds have dispersed and the albondega induced blood rush has subsided. For their part the organizers helped us achieve our incoherent state rather sooner than usual with a revamped ticketing system that had us reaching for the bottle before even a theatre curtain had swished. However, once we’d figured out the secret hand shake it was business as usual and the familiar rhythm of wake-hangover-breakfast-film-drink-tapas-film-drink-hangover was soon beating out through the corridors of the Platjador hotel. 2012 was to be the end of the world. Well, so said the festival party invitations. However, rather than nominate a single apocalyptic film to serve as the festival figure-head the organizers instead spread their chosen theme across the wider line-up, along with a shaky mix of found footage/camera phone offerings. They did take the time out to light candles and cut cake for Spielberg’s classic E.T which was celebrating it’s 30th anniversary (coinciding with Universal’s 100 year anniversary) and served up some party entertainment in the form of a half-cut Dee Wallis who presented a screening of the 80’s classic restored to its former glory. That’s the second year on the spin the festival has opened its legs for Spielberg with not so much as a peck on the cheek from the bearded genius in return. Come on Stevie, any chance of you Amblin over to Catalonia and sparing us a couple of days? First drink’s on us. The festival programming had unfortunately scheduled a number of our wanna-see films for the days prior to our arrival but we still managed to pick out a varied cross section of 26 films for our 8 day assault. The organisers hadn’t really offered us any stand-out candidates for their apocalyptic theme so we decided to mostly follow our Sitges instincts but with the odd curve ball tossed in to keep us on our toes. And we aimed to show the love to two of our other festival favourites Quentin Dupieux, who was following up his 2010 bonkers RUBBER with the equally bonkers sounding WRONG, and Sam “the man that can” Rockwell bringing his own version of crazy in SEVEN PSYCHOPATHS. We had an unlikely to be repeated Cronenberg double bill with Snr’s COSMOPOLIS and Jr’s ANTIVIRAL, and we were stepping up to represent our homies with Ben Wheatley’s SIGHTSEERS and Crispian Mills’ A FANTASTIC FEAR OF EVERYTHING. And as we occasionally like to get our po face on yo! we’d included a couple of straight-laced documentaries with ROOM 237 and SIDE BY SIDE. In the end 2012 may have to go down as the year of the limp-wristed-dragon with little to cheer from our Asian brethren. Granted, we were a little lackluster ourselves in that we failed to see NAMELESS GANGSTER, DOOMSDAY BOOK, THE TASTE OF MONEY (not technically our fault), ACE ATTORNEY and PIETA. And we walked out of THE KING OF PIGS, THE THIEVES and ROBO-G. Hmmm! O.K! I think I can see how we may not have given Casa Asia a fair lick. We quite liked OUTRAGE BEYOND if that’s any consolation. Actually, a glance at Our daily festival Blog would suggest that we failed to fire on all cylinders ourselves so perhaps we’re somehow emotionally linked to our Korean cousins, a bit like E.T to his potted plant. Asian failings aside they may have been hard pressed to add to their CS trophy cabinet anyway as another of our festival heros was in fine form and a worthy winner of the 2012 Corridorstyle Golden Claw Hammer for LOOPER. He may not be prolific but when Rian Johnson has Joseph Gordon-Levitt by his side he’s unbeatable. Well……..that’s what we thought. As usual the jury had other ideas and somehow saw fit to sling HOLY MOTORS the award for best film. Overall there was a familiar ebb and flow to the festival. Apart from the initial confusion over the new ticketing system (mostly our fault) the festival itself appeared as well-run, and well-attended as ever. Another stellar program had been drawn up by the organisers and, while we may not have caught every film we’d hoped, there was the now customary healthy mix of unexpected gems and WTF! swing and misses. As always we like to make sure Angel and his team are hitting their mark and, once again, the numbers proved that to be the case. With 174,000 visitors (130,000 at screenings) the festival had again surpassed the previous year’s attendance by over 10%. Attending journalists were up by a chunky 25% and stats for the now necessary Facebook Likes, Twitter follows, web page hits and Youtube views were all very healthy suggesting Angel has no wrangle with the demands of today’s socially savvy culture. 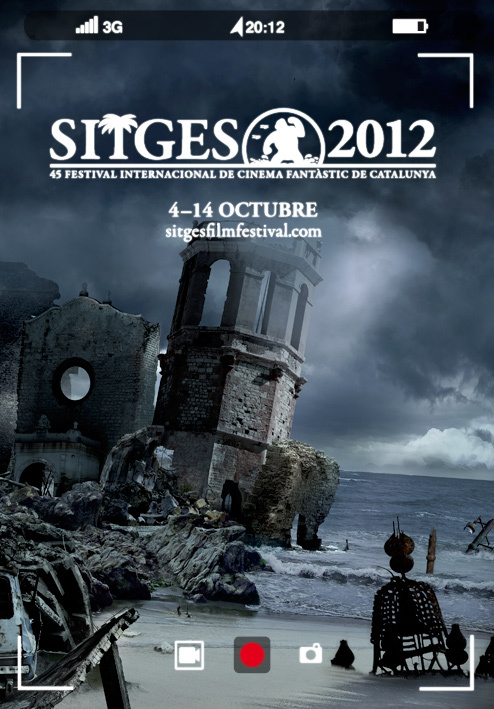 This is of course all well and good and something crucial to the ongoing survival of a festival rolling into its 45th year (and for that we doth our cap Angel), but we still love Sitges for the fact that we get to rub flip-flops with the stars while tucking into pintxos and vino beneath mediterranean skies.